Chair is a piece of furniture, which is used for accommodating one person. Having a seat, legs, back, and often arms, the chairs are designed to provide comfortable sit in various residential and commercial establishments. Chairs made up of rope are made by a team of experienced craftsman by tightly knitting the jute rope with the structure of either wood or metal. The artisans make use of latest weaving or knitting tools to beautifully design and develop the jute rope chairs. Jute is also known as golden fiber and the products made up of jute rope are widely demanded in the market due to their attractive looks. The jute rope chairs made up of jute rope has a perfect blend of modern as well as ethnic designs, due to which these are extensively demanded in Indian and overseas markets. Creative artisans implement their innovative ideas and weave the rope with the frame, beautifully and in an elegant way so as to provide eye-catching appearance. One can avail the jute rope chairs in a plethora of designs, patterns, sizes, shapes and specifications, as per the needs. 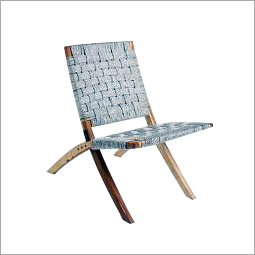 Today in the era of challenging competition, varied jute rope chair manufacturers comes up with varied innovative designs and styles. They made available their chairs in a wide variety so that clients can choose products as per their style, space availability and budget. Jute Rope Chairs find their extensive use enhancing the looks of interiors as well as exterior places. Today, various interior designers prefer handcrafted chairs due to their distinctive appearance. These jute rope chairs are used for sitting purpose in varied homes, offices, institutes, farmhouses, hotels and restaurants. One can also find use of these jute rope chairs in open area cafe houses, parks and lawns for providing comfortable sit.